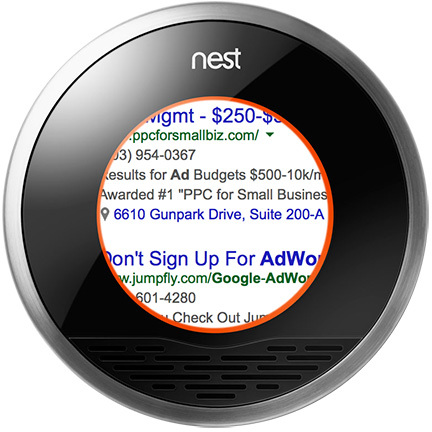 Your Nest thermostat could be serving you ads at some point because Google sees all of its properties as fair game for Google Ads. The Internet search giant said in an SEC filing it sees Google Glass, Android-enabled cars, refrigerators, smart watches, thermostats, and anything else it serves content to as potential ad platforms. Google said it sees ad placement possibilities as an evolving market. "Our expectation is that users will be using our services and viewing our ads on an increasingly wide diversity of devices in the future," the filing stated, according to the Wall Street Journal. Those devices could include "refrigerators, car dashboards, thermostats, glasses, and watches, to name just a few possibilities." That news will come as a disappointment to Nest Learning Thermostat owners who were promised that their personal information would remain private after Google bought the company. That may have been the agreement at the time, but just as Darth Vader was happy to change his deal with Lando Calrissian, Google has apparently done the same with its Nest customers -- or at least it's seriously considering the option. Considering companies like Google are always on the hunt for new revenue streams, it seems likely that advertisements will grow beyond the places we currently find them and will eventually end up everywhere we look, from our cars, to our refrigerators, and even our thermostats.